In soft mocha chiffon, this short plus-size homecoming dress under $150 is ideal for semi-formal events. Crafted with an off-the-shoulder bodice, this short plus party dress has just enough glitz. Shimmering tiny beads accent the lace applique that adorns the sheer-mesh bodice, and structure-enhancing boning provides a nod to classic styling. A net inset adds sheer support to the notched sweetheart dress, and armbands drape alluringly off the shoulders. Topping the satin and tulle-lined skirt, a band of rhinestones sparkles and defines the natural waist. 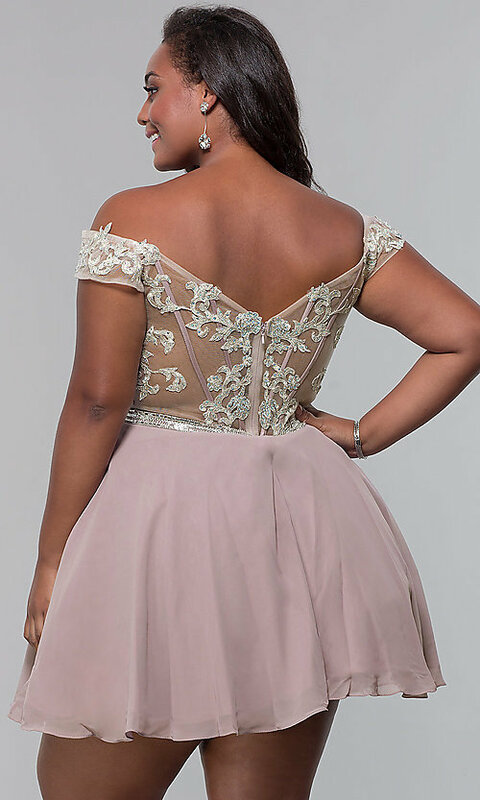 This plus-size mocha pink chiffon homecoming dress offers a stylish option for wedding celebrations, hoco events, and other semi-formal events.